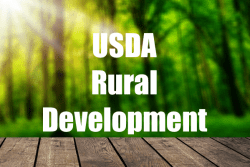 Mortgage Options / What is USDA Rural Development? The USDA stands for United States Department of Agriculture. That’s the federal agency that provides USDA Rural Development programs for the purpose of encouraging economic development in rural areas. Rural Development programs also help the people living in qualifying rural areas afford better housing. The USDA Rural Development Single Family Housing Guaranteed Loan Program is for applicants with a low or moderate-level income. The program offers 100% financing RD loans to qualifying applicants to buy a qualified home in a rural area. Guaranteed Housing loans offer future home buyers the best terms available for zero-down mortgage loans, including low interest rates and payments they can easily afford. What is the Term Length for Rural Development Loans? The Rural Development mortgage has a 30-year term at a fixed rate. This means that applicants will have predictable monthly payments to make for the life of the loan. USDA RD loan applicants can rest easy because USDA loan requirements are quite similar to other mortgage programs. These mortgage guidelines can be broken down into three general categories. Minimum applicant credit score of 620. Zero late payments in the last year. All bankruptcy payments made on time. At least three years passed since a foreclosure. Applicant must have a dependable two-year work history. USDA minimum debt-to-income ratios of 29%/41% must be met through documented income. Properties eligible for a USDA Rural Development Loan must be located in approved rural areas and must meet USDA appraisal standards for property and value. Rural Development Loans are designated for housing that can be described as ‘moderate’. This term refers to the architecture and design of the house as well as the price. A house that is being renovated can qualify for these guaranteed housing loans, but they must meet the state’s building code and HCFP standards. Newly built manufactured housing may qualify, but previously existing manufactured housing will not necessarily be accepted for these loans. RD loans don’t contain maximum amount that applicants can borrow. Instead, each applicant’s ability to afford the property will be determined by the qualifying ratio. Generally, applicants are required to need to spend no more than 29 percent of their monthly income on the housing payment, the insurance and taxes. Furthermore, only 41 percent of their income can go toward their existing debts. To make the purchase as affordable as possible, those qualifying for Rural Development loans can roll over any closing costs and fees into the loan if it is necessary. If the house needs to be improved, these costs can also become a part of the loan.